Company A, a PSC Oil & Gas Company, is evaluating the development of a new gas field development. Strategic management decision in the preliminary screening stage shall be taken considering many aspects. One of the critical aspects is development cost of the gas processing plant. Since the decision shall be taken early, there is no sufficient time to conduct good and fully complete engineering study. In this stage the research is going to select qualitatively what is the most suitable cost estimation method. AACE International identifies five classes of estimates. 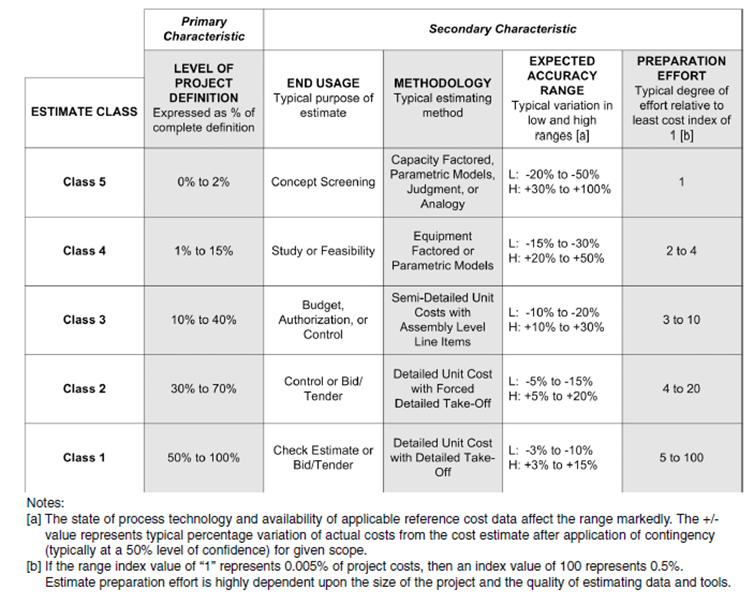 A Class 5 Estimate is associated with the lowest level of project definition (or project maturity), and a Class 1 Estimate is associated with the highest level of project definition. 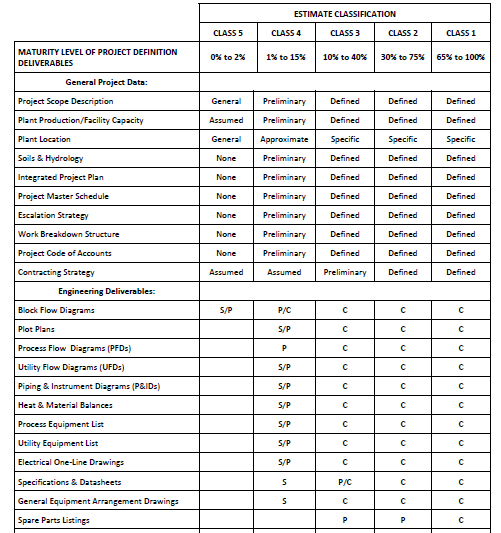 Below matrix provides the Cost Estimate Classification for the Process Industries, including the preparation effort for each estimate class. From matrix above, in the column “METHODOLOGY Typical estimating method”, we can see several estimating method, which the selection were driven by the estimate class, level of project definition, and end usage (typical purpose of estimate). Then we need to know what each method means and how those methods different with each other. If the capacity of facilities being factorized is relatively close in size, and if the capacity factor can represent the actual value, then this estimation can be quite accurate. Then, from Table 2 data above, we translate them to match with Table 1-Estimate Classification Criteria, to identify belong to which class that those data are suitable. Based Table 3 above, the nearest estimate classification suitable for this current stage of development is Class 4. 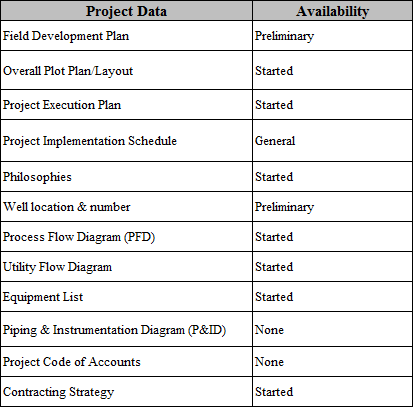 We can conclude that the current project development stage is in feasibility or study stage. To do the Class 4 estimate, based on matrix in Figure 1 above, the recommended estimating method that we can use are equipments factored and/or parametric model. After we determine the method, we can continue to do the cost estimate using the chosen method with utilizing the available data. 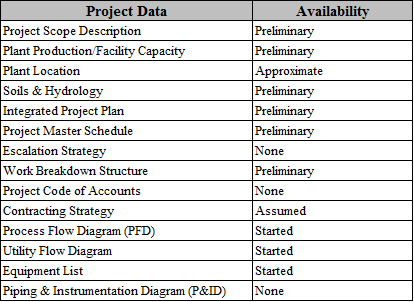 It is also important to monitor and maintain the information or data updates such update on engineering deliverables, execution plan, master schedule, contracting strategy, etc, which could potentially impact to the level of project definition and suitable cost estimating classification criteria. Christensen, P.et.al.(2011). AACE International Recommended Practice No. 18R-97. United States of America: AACE International. Please find my W24 blog here. As per your request, after this I will write the lesson learned in my W25 blog. Great Pak Harnadi……. See you on Monday morning…..!! !